Riga is an historic city that is increasingly being discovered by visitors from the west, as Latvia becomes more integrated with the European mainstream and throws off the shackles of its Soviet past. That process has seen several superb luxury hotels emerging, as tourists and business people come to Riga on an increasingly frequent basis. The Gallery Park Hotel Riga is one of the very best, not least as it includes a superb spa, to help guests truly relax and detox. As opulent and stylish as it gets, the Gallery is the only hotel in Latvia to be included in the Chateaux and Hotels Collection, nominated as a superior five-star luxury boutique hotel. Whether in town primarily for business or pleasure, visitors can mix both in a grand building that underwent a major restoration before being opened in 2009. Inside it is a superb restaurant serving gourmet cuisine, a gym, steam room and its magnificent spa, along with rooms and suites decorated with antique furniture and works of art bought from some of the leading auction houses in the world. This mixture of time-honoured elegance and style also includes the most modern and luxurious amenities, including underfloor heating. The hotel is also equipped with a business suite and meeting facilities, making it ideal for those who come to the city for important meetings with commercial partners. If the inside of the hotel is wonderful, so too is the setting. 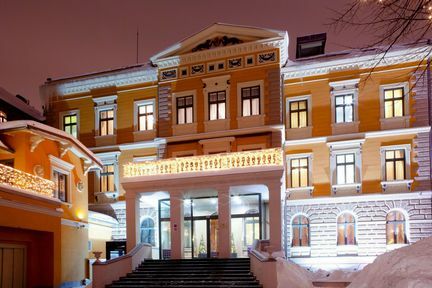 Every single room has a view of Kronvalda Park, Latvia’s National Museum of Art and the famous Riga Boulevards. The wonders of this panorama should come as no surprise, for the hotel is located in the Old Town area of Riga, a UNESCO World Heritage site. This makes it perfect for those who want to explore the architecture and history of this important part of Riga, dating back to its establishment as a 13th century Hanseatic League port. Without question, the Gallery Park Hotel and Spa is a superb place to stay. Indeed, however important it may be for some to come for work reasons, there is no doubt there will be plenty of pleasure mixed in.